Find out why your back and sore spots are begging for one of these. Targeting specific problem spots by pushing down on the connective tissue, this technique is best suited for chronic knots, scar tissue, repetitive strain and postural issues. Its deeply relaxing properties are not for the faint of heart because it makes liberal use of elbows, forearms, ceramic, and wooden or glass tools for optimal penetration of the muscle. Chronic muscle tension manifests itself in adhesions around muscles and ligaments. A deep tissue massage has the ability to break this down in the course of one or a few sessions. The pressure applied is not as rhythmic as a Swedish massage, and uses more pressure and cross-grain strokes, releasing built-up toxins in the process. Try and breathe deeply while you're laid out on the massage table to assist in the process of oxygen and blood circulation. You may be a tough nut to crack and bounce off the massage table with no soreness, but it's best to take things easy after a deep tissue massage. Experts recommend soaking in a warm bath with Epsom salts to draw the toxins from your body. Some basic stretching is also advised to pre-empt any soreness. Increased mobility and a drop in blood pressure are some of the added benefits of the deep tissue massage. According to a study, people who had this massage saw their systolic pressure drop by an average of 10.4 mm Hg and their diastolic pressure drop by an average of 5.3 mm Hg. It decreases pain by targeting inflammation and increases the production of serotonin. 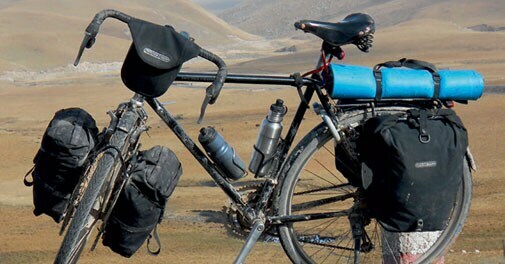 Look for panniers with fewer zippers because the constant tugging wears them out easily. The roll-closed varieties keep the contents dry and are easier to fill up. Avoid clamshell tops and buckles if you need extra space. Cyclists swear by Ortlieb. This life-changing accessory fits into stiff soles and allows great momentum. The release mechanism needs a single twist of the foot. To minimise the possibility of a rattly ride and keep bolts in place, try Loctite Blue. The product works best between closely fitted metal parts. You can get by with rubbing this on, without pulling your bike apart. You need to be prepared for the inevitable flat tyre. And when that happens, use the tyre lever to lift the tyre's bead into place without marring the rim.